As the saying goes, good things come to those who wait. Sadly for some of the dogs available for adoption at The Lost Dogs’ Home that wait can be a little longer than others. Today we would like to introduce you to two special dogs who are searching for their ideal best mate. One year-old Sally is a stunning heeler cross who has the brains to match her beauty. While she is an active dog, this shy girl is also happy to unwind at the end of the day with her family by her side. With her active nature and intelligence it is hard to believe that this beautiful girl has been looking for a home for 70 days. When she first arrived at the Home in April Sally was scared of other dogs, traffic and people. To help her manage her fears, Sally was placed in the Home’s behaviour program and hasn’t looked back. While still a little shy around people she hasn’t met yet, Sally is able to calmly walk past other dogs and enjoys spending time outside with her family. Sally would make a wonderful companion for a range of owners. But she does prefer the company of humans and would be best suited to a family where she can be the main dog in your life. Preferring the quiet life, Sally would thrive in a quiet suburban or rural area where she can listen to the wind rustle through the trees. With a family who is committed to her ongoing training and is prepared to take things slowly to gain her trust, Sally will blossom into a wonderful family pet and loving companion. You can see more about this intelligent and active dog here! Bull arab cross Dino is a big, goofy guy with a heart of gold and a lot of love to give. He is an excitable, loving youngster who enjoys the company of people, which is why we are surprised that he has spent 28 days looking for his new best mate. Arriving at the Home in May, Dino needed to work on his impulse control as he was a little over enthusiastic. However, after spending some time with the behaviour team this lovable guy now understands the best way to share his love with you. 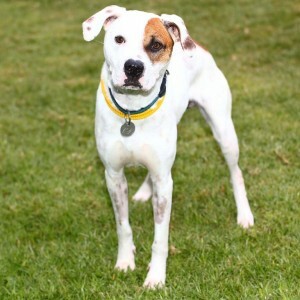 Dino would thrive in a home with a big backyard where he can play with a range of different toys and stretch his legs. Despite his playful nature this big guy can also be a bit of a couch potato and does enjoy walking at a leisurely pace. This big softie can find dog parks a little overwhelming, but he would benefit from a calm doggy companion to show him that there are ways for Dino to keep his enthusiasm in check. This lovable guy would benefit from finding patient owners who are committed to keeping up his training routine. Over time it will be a rewarding experience and a great opportunity to watch this lovable guy’s confidence grow. To see more of this lovable guy in action click here! You can meet Dino and Sally in the fur at our North Melbourne shelter at 2 Gracie Street, North Melbourne. 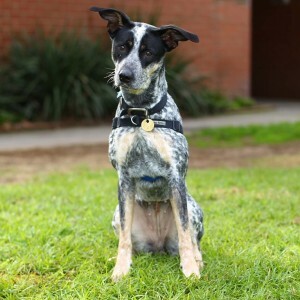 As they have been through the Home’s behaviour program, you will need to call our North Melbourne shelter on (03) 9329 2755 to arrange a pre-adoption appointment with our staff.